Windows 10: Issues, Concerns, and Solutions - The Chicken Coup - Chickensomething What Are You Afraid Of? Microsoft’s new Windows 10 operating system is immensely popular, with 14 million downloads in just two days. The price of the free upgrade may just be your privacy, though, as changing Windows 10’s intrusive default settings is difficult. "And speaking of guys furiously hacking while getting blown with a gun to their head"
Lots of new spyware, keyloggers, data miners are incorporated into the software by default. Only the gods of cyberspace know what else there may be. Perhaps some apps are in order. Listing fixes and settings for users would be a good idea. With that in mind, here's a nice video on changing the default settings in the new windows 10. "You have to use the Local Group Policy editor, registry editor, Administrative Command Prompt, and other deep administrative tools in order to disable all the stuff. But the question remains, do you trust that it is really disabled, and not just lying whilst secretly staying enabled for CIA backdoor or something." I thought backdoors where already installed in the hardware before it's put in the box and shipped to the store. Let the debugging begin. Give it away for free, have every user help debug the software, then one year later start charging service fees to use the software. Windows 10 free License Activation, only allows windows to run on the same hardware, so in every boot it Checks bios to see if the hardware is the same. But apparently Windows 10 is actually writing to the Bios, killing or crippling many computers. Windows 10 restore resulted in being stuck on the BIOS screen. Windows 10 has a reputation for “phoning home” more often than its predecessors, and while that’s primarily true, much of this was already present in Windows 8—and an awful lot of it is present in other products like Android, iOS, and Chrome. That’s not to say all of those settings are good, just that there’s very little new happening here. 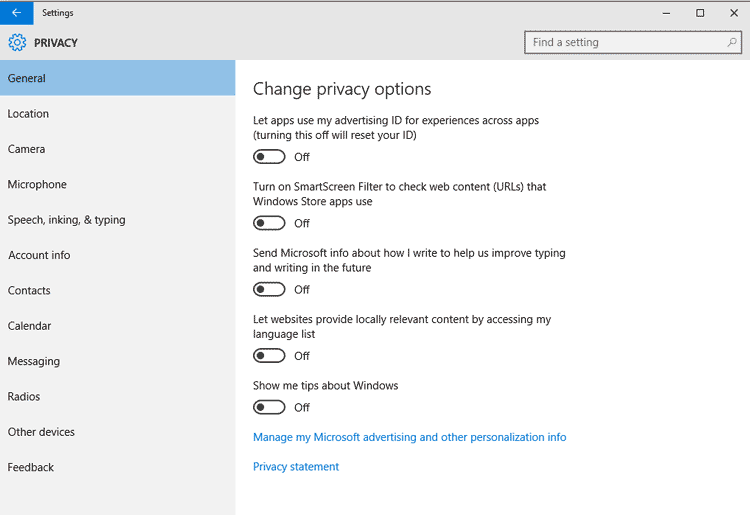 You can read the privacy statement for Windows 10 here. It’s not quite as sweeping as the Windows Insider Preview policy that caused so much commotion, but it’s still very broad (as most privacy policies are). Plenty of sites have published lists of all the features you should turn off in Windows 10 to protect your privacy, but many don’t explain in detail what each of these settings do, which makes it hard to separate FUD from fact. So let’s go through those settings and explain what we know about them, where the real problems are, and how to turn everything off.